Typically, home sales are on the rise this time of year. However, this June saw a decline in home sales, the lowest in 2 years. Land saw a significant rise. Could this be the start of things to come? In looking at the number of units sold during the month of June, 2016, there is a noticeable decline in home sales. However, in looking at the dollar volume, there was an increase in the YOY (Year Over Year) data. This is most likely because there were significantly more homes over the $1,000,000 price tag that sold. Will these sales continue? In comparing sales for the last few years we see the market as holding fair. There are no real drastic changes. As a result, one may expect the market to continue as is. The sharp rise in land sales is very encouraging to those that have had their property on the market for quite some time. However, when looking at the prices for which these properties sold, as a whole, sellers only received about 68% of their asking price. In other words, those willing to bargain or with greatly reduced pricing are the ones most likely to sell their property. We still have a great amount of inventory of both homes and land. This will continue to hold prices down. It also means that the chances of viewing any particular listing are low because there are so many properties (both homes and land) to choose from. This is called, “Substitution.” Think of it this way; If you walk into a car lot and they have several models available, what makes you choose one over another, especially if they’re priced the same? Do your homework. This is not going on line nor looking at real estate magazines to see other homes listing price. Listing price’s do not drive the market. It’s the “sold” or “closing” prices you need to be seeing. This data is available through County records. Some web sites have “estimates” or a variation of such. This data can be very misleading as it typically uses averages. Average’s do not work as they use a large area and some of the comparisons (comps’) may not be fair. Read this article, “How Much Is My Home Worth” to find ways to determine you home value. Hire and appraiser. Appraisers will look at the closed properties in your area and make adjustments accordingly. There are several methods they use to arrive at a Fair Market Value. This is why banks hire them for appraisals. Here is a Uniform Residential Appraisal Report you can use on line. However, if you’re not familiar with these methods, you may want to forego using this form to help assess your value. Get a CMA. A Comparative Market Analysis can be done by your real estate agent. This is done very similarly to what an appraiser will do. However, experience and knowledge of the area are paramount in arriving at these figures. Some brokers may walk in and give you a number, but this just may be a number you want to hear. Request the data. Here again, caution may be needed. Brokers can choose whatever properties they want to make your numbers shine. This is sometimes referred to as, “Buying your listing.” Read this article, “Salesman Or Agent, Is There A Difference?” to help you find a top listing agent. Be Patient. Some markets are doing quite well. You may have an offer the same week or month. However, in this area, the average DOM (Days On Market) for homes is 530 days. That’s nearly a year and a half. Unless you are priced very well, expect it to take some time. Land DOM is even higher. Total homes listed in Highlands/Cashiers MLS: 1458 – This about the peak of inventory for our area. More homes come on in the summer. Inventory: 31.7 months – This is a slight increase due to more homes coming onto market for summer sales. Average List/Sell Ratio: 89.99% – This is based upon the “List” price at the time an offer was made. Many homes had higher prices initially, then reduced after long periods of DOM. Synopsis: We are nearing a busy part of our season for the upcoming few months. To capitalize on selling your home, make sure you are priced where you need to be to entice buyers to see your home first. Land Units Sold: 19 That’s a 58% increase in land sales. Total listed in all MLS: 1271- Holding steady, which is good news. Inventory: 91 months. This is GREAT news. We dropped nearly 10 months worth of inventory. However, that still leaves us in excess of 7.5 years of inventory. Healthy markets are considered below 6 months. We have a long way to go. 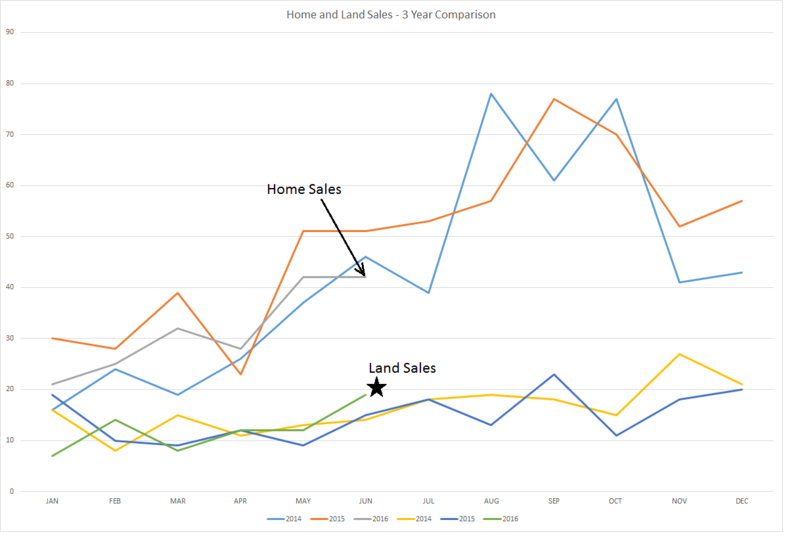 Synopsis: The recent rise in land sales is encouraging. However, in looking at sales for the last few years, no real change is expected. Still, it’s good to see positive signs. 36% of home sales ranged from $200,000 to $499,999. This continues to be the major portion of market sales. 15% of home sales ranged from $500,000 – $749,999. This was another significant rise in homes in this price range. 31% of sales were above $1,000,000. This is a huge increase from 17% in May. Sellers, don’t be discouraged by the lower number in home sales. We are coming into the busy part of the year. The next few months will give a better picture. Buyers, land owners have been accepting incredible offers. Don’t be shy about making an offer. There may be no better time than the present to purchase land.